Dr. Horsehair - What is minstrel music? A bone player in swallow-tail coat and fancy dress shirt, ca.1860. The attire shown here is typical of the costuming used for the minstrel show's first part. Oh! Susanna, Dixie, The Camptown Races, Buffalo Gals, and Jim Crack Corn are but a few of the very popular songs known from the minstrel era. It is the music which is the source of bluegrass, country and old-time music of today as mentioned in the book, "Bluegrass Breakdown" by Robert Cantwell. Minstrel music itself is composed of Celtic music and Afro American music technique. When a plantation owner had a man with musical talent, he might send him to New Orleans or up north to be trained in violin so he could play Celtic music for the cotillions and parties. But, when that man was alone in his quarters, he would pour his African soul into his Irish fiddle. This was the music the "black faced" minstrels tried to copy. Minstrel music was established in the late 1830s with the development of the five-string banjo by Joel Sweeney of Appomattox Court House, Virginia. This new form of music became very popular as the performers, working usually in pairs, toured from town to town or traveled with the circus. 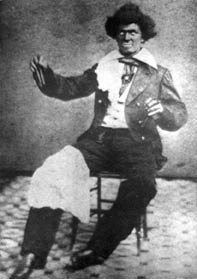 In 1843, Dan Emmetts "Virginia Minstrels" performed the first minstrel show with banjo, fiddle, bones, and tambourine. From this point, "minstrel mania" swept the nation as hundreds of minstrel troupes toured throughout the country. It reached its peak in the 1850s and 1860s as it became the popular music of the people. It ran on New Yorks Broadway for over forty years, and was the music of the Mexican War, the California Gold Rush, and the Civil War. This form of popular music gave birth to our Ragtime, Blues, Dixieland, Barbershop Quartet, Country, Bluegrass, and Old-Time music of today. The banjo was the foundation of the minstrel show, and was always played with the back of the fingernail in the "stroke" or "banjo" style. Today, a simplified version is called "frailing or "clawhammer". The banjo went to California with the forty-niners and out west with the cowboys. After the Civil War, soldiers returning to the mountains brought the banjo and minstrel music back with them where it was preserved. Many of our present day songs such as, Angelina Baker, Lynchburg Town, Gwine Back to Dixie, Ring, Ring De Banjo, Darling Nelly Grey, Hand Me Down My Walking Cane, Listen to The Mocking Bird, Yellow Rose of Texas, Arkansas Traveler, Nelly Bly, Old Uncle Ned, to name a few, had their beginning in the minstrel show. Today, this historic form of music is returning to popularity with many unknown songs of the past, such as Whos Dat Knockin at The Door?, Rose of Alabama, The Good Sweet Ham, Jim Along Josie, Nicodemus Johnson. Songs of our rich American heritage are returning to life after a hundred years of silence. Foremost among those performing this music today are Bob Flesher and his band, "Dr. Horsehairs Old-Time Minstrels. Dressed in authentic costume of the old minstrels (without black face), they perform minstrel and old-time string band music in bluegrass festivals, folk festivals, concerts, and corporate functions around the country, as well as the 1996 Olympics. Bob Flesher presents the history of the banjo in workshops, schools, and universities. He is the only performer to use original 1850s and 60s banjos with gut strings and calfskin head in order to achieve the original authentic sound. Bob Flesher also builds authentic reproductions of minstrel banjos as played by David Holt, Tony Trischka, Bill Evans, Dan Levenson and Wayne Erbsen. If you have an event coming up write for information for booking Bob Flesher.